Due to the tremendous size of Endeavour they said, streets along with sidewalks will be closed to vehicles and pedestrians to ensure public safety. The public should anticipate traffic delays on the route and in the surrounding areas throughout the Endeavor’s last mission. Sidewalk closures along the route may be opened as determined by the Unified Command based on street width, fixed obstacles, and public safety issues on a block-by-block basis. Unified Command realizes the inconvenience “Mission 26” is having on local communities and will make every effort to balance both the needs of the public with the goal of getting Endeavour to its new home. 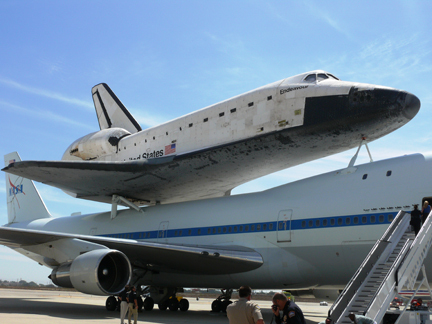 “Endeavour is a unique item and its transportation presents a unique challenge,” said Mayor Antonio Villaraigosa. Members of the public interested in viewing Endeavour from the city sidewalks and intersections should expect large crowds and heavy traffic. They should arrive early, be prepared to stand long hours, and remember to bring water, snacks, sun block, hats, and chairs. In addition, spectators traveling from distant communities are reminded to please be respectful of private property, said Unified Command spokespeople. The California Science Center Foundation and Unified Command have dedicated viewing public locations along the route. On October 13, at around 8 a.m. to 10 a.m., the city of Inglewood will have an event and Endeavour will be on display for half an hour, in front of the Forum. There is ample free parking at the Hollywood Park Race Track. There is no over-night staying, and parking lots open at 4 a.m. Contact www.CityofInglewood.org for additional information. On October 13, at around 2 p.m., Endeavour will stop for about a half an hour for a planned event at the intersection of Crenshaw Blvd. and Martin Luther King, Jr. (MLK) Blvd. There is a dedicated area for the public to stand and view the stage, north on Crenshaw Blvd. from MLK. Space is limited so come early. On October 13, at around 8:30 p.m., Endeavour will reach its final destination. Large parking lots have been dedicated for public viewing. Four parking lots between Bill Robertson Lane and Vermont Ave., north of MLK will provide ample opportunity to view Endeavour as it moves towards the California Science Center’s Samuel Oschin Pavilion. Mass transit is recommended and available via the Expo Rail and bus lines running along Exposition Blvd. “Nearly 700 Los Angeles Police Department cadets and volunteers from throughout the community have been dedicated to assist with ensuring Endeavour reaches its destination,” Los Angeles Police Chief Charlie Beck said.